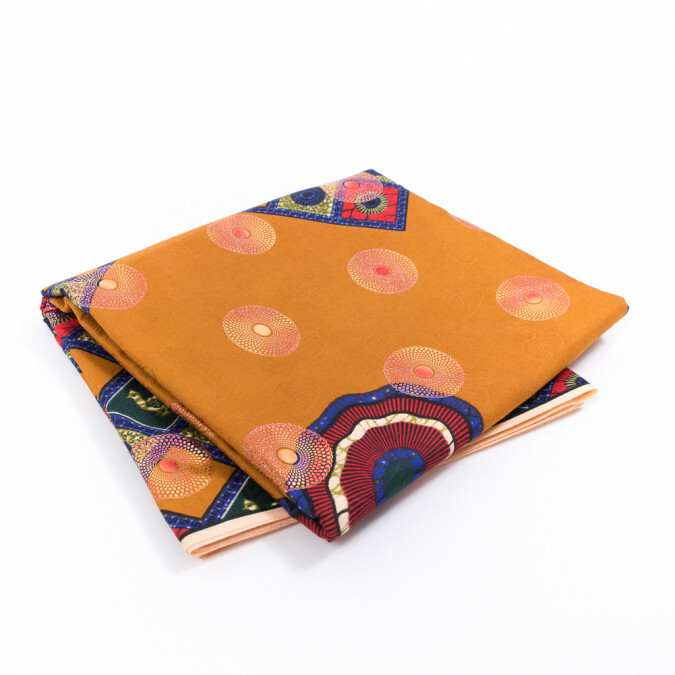 Description Although this Butterscotch Waxed Cotton African Print is covered in squares it is anything but ordinary. A grid of blue green and red cover either side of this woven while geometric circles scatter through their core. Red and gold ombred metallic medallions take this print to the next level as they shimmer and shine with every movement. With the weave itself resides an inlaid pattern of leaves on a diagonal vine. Transform this smooth woven into high-low dresses full skirts and tailored tops for a refreshing update to your spring/summer style. Thin and of a medium weight it is opaque allowing a lining to be optional. Note: Our African Prints come in 6 yard bundles and each of these bundles come with specific care instructions attached. To forgo residue from the labels use a steamer against the back of the fabric.